WE’RE THERE!! YOU ARE AMAZING!! Thank you so much for your generosity and support in making Bruno, our Wood Fired Kiln, a reality. Work has been completed and our first firing was in August, 2016. Please refer to the donation chart below to see the benefits of each donation level. Also, checkout the other Bruno Posts. Our hope is to raise the last $4600 towards building “Bruno” which will cost about $20,000. 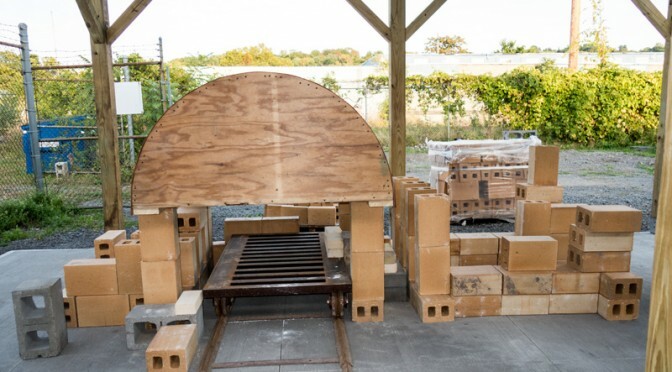 The project involves a 20′ x 20′ concrete pad, kiln shed, and a cone 10 Bourry Box Wood Kiln. Donations are in increments of $100. Below is a list of “gifts” for your donation. All donations can be called into or made in person at Northeast Ceramic Supply, 10 Monroe Street, Troy, NY (518) 274-2722. There will be a “Bruno Gala” for all donors before the first wood firing. The Donor “Bruno” Tile will be a handbuilt tile created by Barbara Reeley with a carved abstract drawing of the wood kiln “Bruno” and the name of the person(s) donating. The Vase will be a wheelthrown vase by Barbara Reeley which will be bisque fired and then fired in our inaugural Bruno firing. If you have any questions please call (518-669-5296) or email (claywomn@aol.com) Barbara Reeley.